Eye Candy Friday is so much easier in the summer. Today I had to choose between three flower photos – an evening primrose blossom, a tiger lily, and this geranium. I love having choices! I also love weekends. Hope yours is a good one. There’s something memorable about the scent of a geranium leaf. It’s a “mandatory smile” kind of thing. I have a geranium about that same color! Happy weekend!! Love the color! Happy weekend to you guys! Lovely! Have a fun weekend! Beautiful color – have a great weekend! It’s gorgeous – and I heard a rumor that the east coast is supposed to see some sunshine and warmth this weekend – woo hoo! Somedays I wish internet was scratch-and-sniff. 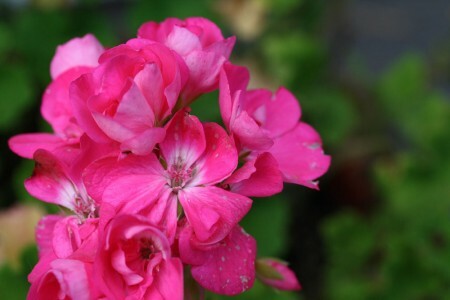 I just love geraniums. Thank you! It’s gorgeous. Happy weekend to you! Pretty. You’ll have the other 2 for the following 2 Fridays. My favorite summer flower. Hope your weekend is full of great things.